(Newser) – It's a "scientific legend": that Mona Lisa's eyes follow you wherever you go, a phenomenon so well known that it birthed the term "Mona Lisa Effect." Except it's not true, at least in the case of Leonardo da Vinci's painting. That's the conclusion of two researchers from Bielefeld University's Cluster of Excellence Cognitive Interaction Technology. The effect itself "is undeniable and demonstrable," says Dr. Sebastian Loth, per a press release. But the result of more than 2,000 assessments of her gaze found that not to be the case. 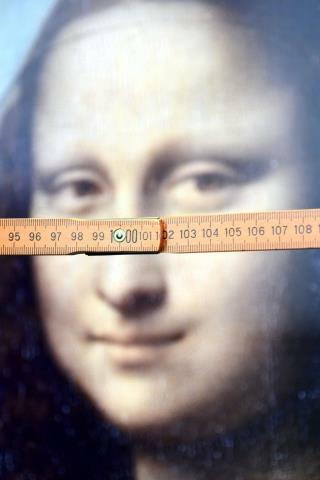 To facilitate the study, published in the journal i-Perception, 24 test subjects were seated in front of a computer screen showing the Mona Lisa and told to look at a folding ruler and say which number her gaze was directed to. Interesting, I guess. Never looked at only her eyes before. To me they look either sly or flirtatious. If the painting is true-to-life, she must have been quite the gal. I'd like to see them try to measure "Sparticus'" "gaze angle."